Rick Ross dropped out of high school, functionally illiterate and with few prospects. Within a few years he was running a successful business, had dozens of employees, and was worth millions of dollars. “Young blacks stood openly on sidewalks and even in the street to hawk their product to passerby’s as if it was the most legal thing they’d every done.” Rick saw the business on 81st street and saw opportunity. Any compelling autobiography knows the story is more about the time and community, then about any specific individual. Freeway Rick Ross reads partly as the classic businessman’s story, putting together whatever little cash he had to get a start and get ahead. Ross’ first business was buying and selling subsidized meal tickets. “All I had to do was purchase tickets from Bret Harte underprivileged students. They were more than happy to get money for something they were ashamed to use, then I’d sell the tickets to those who could afford them, and I made a profit.” Rick compassionately explains why students at Bret Hart were embarrassed to use the meal tickets, while also explaining the puzzling reasons middle class students at his new high school desperately wanted the meal tickets. The book weaves together the history of South L.A., the migration of blacks from southern states, to find work and prosperity in the Golden State, and the growth of gang culture. While Rick was never a member of a gang his close family relationships and friendships with top leaders kept him and his business protected. Dates are sometimes lost in the narrative, especially as the corrupt LAPD Freeway Rick Ross Task Force increased their focus. The narrative is driven by Ross’ personal story and as important figures are introduced their future notoriety is revealed for context. As the story introduces the shadowy interplay of the Nicaraguan drug supplier and the connections to the Iran Contra scandal the story focuses on Ross and does not get lost in the Iran Contra story. After his arrest and imprisonment, Ross learned to read, partly as a way to prepare his own defense in the appeals courts. Once he was released, the second time, he was finally able to go “legit” and now teaches economics, while working with the community. 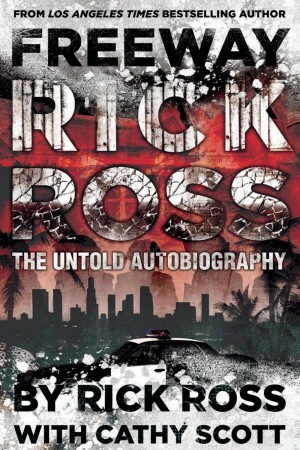 For readers whose only context for life in South L.A. comes from movies and music produced in the early to mid 90s, Freeway Rick Ross gives a compassionate view of the delicate game people played to fit in, while trying to get out or get ahead. Freeway Rick Ross focuses on the life of one man at the center of the cocaine epidemic and a key player in revealing LAPD corruption and the Iran-Contra scandal. This is all done with a compassion and insight on the history of South L.A. and the drug trade. Posted in Published	| Tags: Bishop Noel Jones, Cathy Scott, cocaine, Freeway Rick ross, Los Angeles, NY Journal of Books, Rick Ross, South L.A.